Australia are set to lose their star full-back ahead of the Rugby World Cup in Japan 2019, as he sets his sights on a move back to Rugby League. Israel Folau is out of contract in 2018 and there are talks of him going back to League, although I'm sure the Top 14 will have something to say about that! 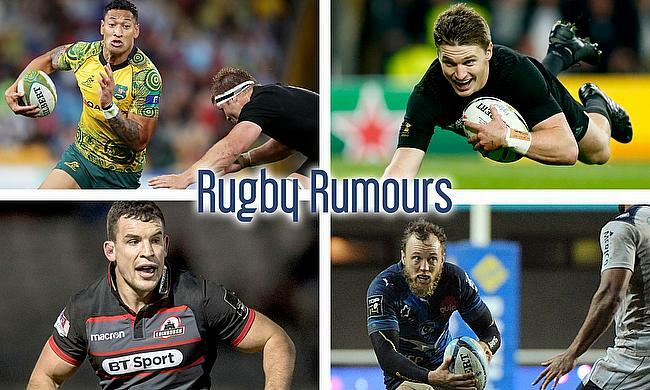 A unnamed Top14 club is reportedly prepared to offer the 26-year-old New Zealander a three-year contract that's worth an eye-watering/record-breaking £1.8million a season. Montpellier's Australian import Jesse Mogg is having to exit the club after the arrival of Johann Goosen in the not to distant future. He has picked up some interest from fellow Top 14 club Pau, who are looking to take the 28-year old Wallaby of their hands for the 18/19 season. Richard Cookerill recently confirmed that the Scotland flanker, John Hardie will be leaving his Edinburgh teammates at the end of the season. The New Zealand born back-rower is linked to Aviva Premiership side Newcastle Falcons, as well as ex-Scotland coach Vern Cotter's Montpellier.